True Wild Life | Banded Palm Civet | The banded palm civet is a rare species of civet found in the tropical forests across south-east Asia. 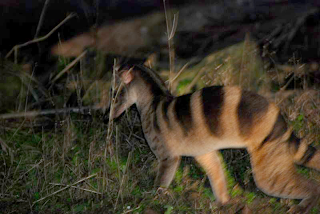 Banded palm civets were named for their tan and black striped coats which give the banded palm civet more camouflage in the surrounding jungle. The banded palm civet is found inhabiting the tropical jungles and rainforests throughout much of south-east Asia including Burma and Thailand, and throughout most of Malaysia and Indonesia. Unfortunately, banded palm civets have been drastically affected by increasing deforestation (and therefore habitat loss) in their native regions. 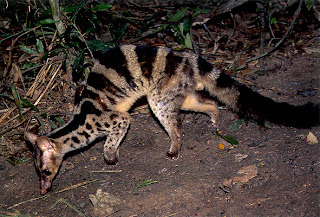 The banded palm civet is widely spread and fairly commonly found throughout much of south-east Asia and despite their cat-like appearance and behaviours, banded palm civets are not felines at all but are in fact more closely related to other small carnivores including weasels and mongooses. The fur of the banded palm civet is one of the most distinctively marked of all civet species. The banded palm civet is solitary animal that only comes out under the cover of night to hunt and catch food. These nocturnal animals are primarily ground-dwelling and highly territorial. 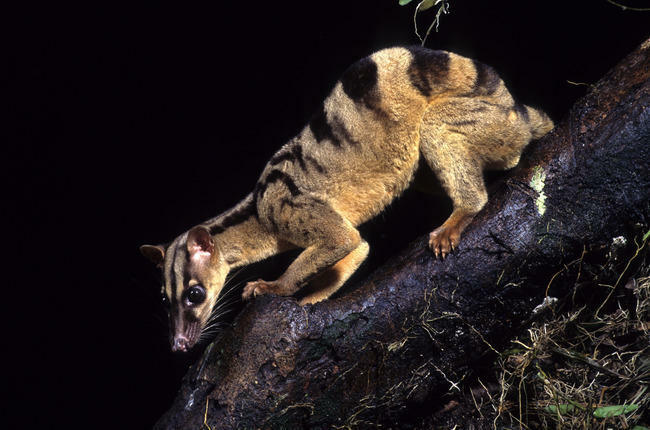 Despite being predominately ground-dwelling though the banded palm civet is known to climb up into the trees either in search of food or to hide from approaching predators. The banded palm civet is a carnivorous animal, and like other species of civet, it survives on a meat-based diet, supplemented by the odd plant or fruit. Small animals such as rodents, lizards, snakes and frogs make up the majority of the banded palm civet's diet, along with insects and other small creatures scuttling through the under-growth. Banded palm civets are also known to eat the fruits and flowers of palms, mangos and coffee in their natural habitats. Despite being a secretive yet relatively ferocious predatory animal, the banded palm civet is actually preyed upon by a number of predators within their natural environment. Large predatory cats are the most common predators of the banded palm civet including tigers and leopards along with reptiles such as large snakes and crocodiles. The female banded palm civet usually gives birth to up to 4 young after a gestation period that lasts for a couple of months. The babies are weaned by their mother until they are strong enough to fend for themselves. Banded palm civets can live for up to 20 years, although most rarely get to be this old. Today, the banded palm civet is under threat from deforestation and therefore drastic loss of much of its natural habitat. The main reason for such extensive deforestation in the area is either for logging or to clear the land to make way for palm oil plantations.